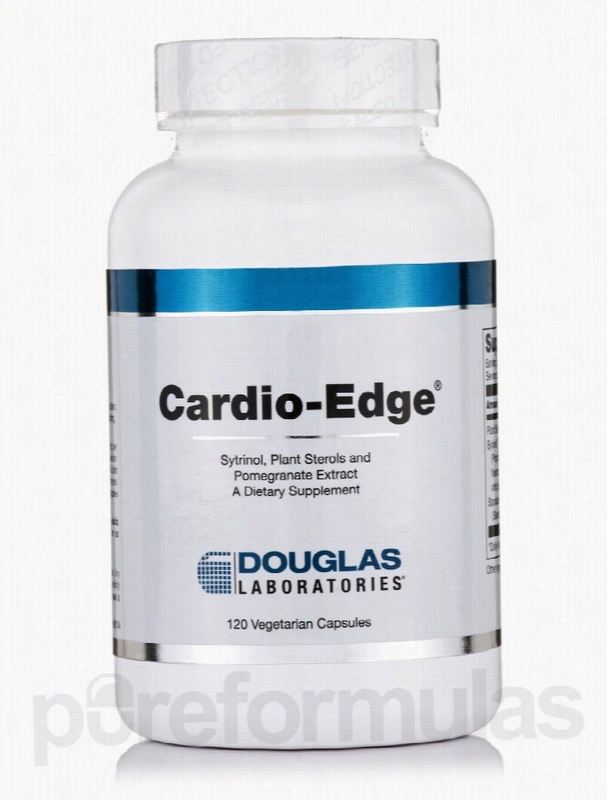 Douglas Laboratories Cardiovascular Support - Cardio-Edge - 120. Looking to start taking better care of your cardiovascular system? You might want to consider trying Cardio-Edge from Douglas Labs. Cardio-Edge is formulated with several ingredients that may be able to improve certain aspects of your cardiovascular health. For instance&sbquo; this supplement features pomegranate extract. For centuries the pomegranate has been used for medicinal purposes. Recently&sbquo; it has been suggested that this special fruit features certain chemicals that may support numerous parts of our health - like cardiovascular health. Pomegranates - like the type found in Cardio-Edge - may contain anti-inflammatory chemicals&sbquo; which may be extremely useful in promoting a healthy functioning cardiovascular system. Douglas Labs' Cardio-Edge also features Phytosterols&sbquo; plant chemicals that may have some potential health benefits. One of these possible benefits is the inhibition of certain substances in the body that may contribute to poor cardiovascular health. Cardio-Edge also features Sytrinol&trade;&sbquo; a proprietary blend of flavones and tocotrienols. These two substances may not only offer some cardiovascular benefits&sbquo; but they may also exhibit some antioxidant properties. An antioxidant is any type of substance that has the potential to root out and eliminate excess free radicals from the body&sbquo; which some studies and research have suggested may be linked to potential health risk. This means that the ingredients in Cardio-Edge may not only offer some great cardiovascular benefits&sbquo; but also benefits for our general health as well. Douglas Laboratories is a pioneer in the field of personalized nutrition. Since its founding in 1955&sbquo; Douglas Labs has been on the leading edge of nutritional technology&sbquo; allowing it to provide superior vitamins and other supplements. All Douglas Labs facilities meet or exceed ISO 9001 &amp; ISO 17025 quality standards. With such attention to safety and use of only the best ingredients&sbquo; you can trust the Products that come from Douglas Laboratories. These statements have not been evaluated by the Food and Drug Administration (FDA). These products are not meant to diagnoseÃ¢ÂÂ treat or cure any disease or medical condition. Please consult your doctor before starting any exercise or nutritional supplement program or before using these or any product during pregnancy or if you have a serious medical condition. 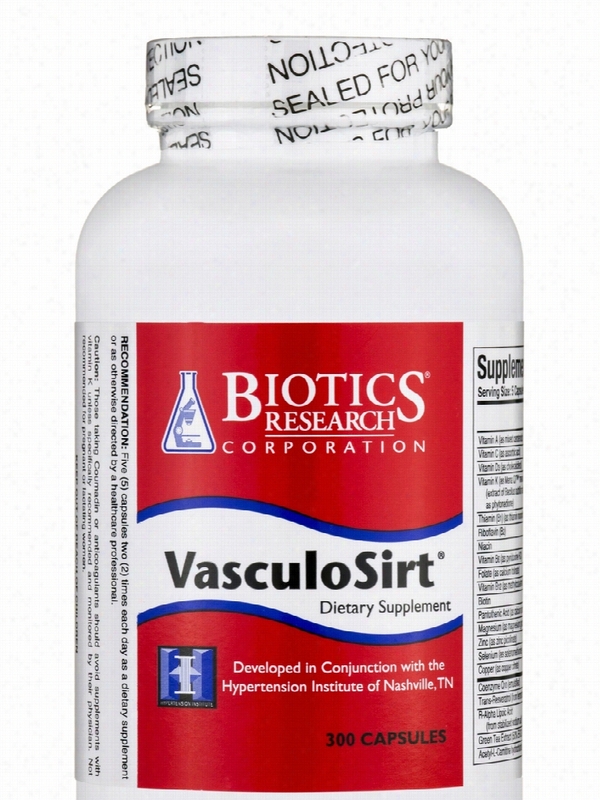 Biotics Research Cardiovascular Support - VasculoSirt - 300 Capsules. Heart trouble isn&rsquo;t something that just affects older people&sbquo; or those who are out of shape. You can end up developing heart problems at any age due to genetic conditions&sbquo; damage to your cells from harmful particles called free radicals&sbquo; or an unhealthy diet. You can help fend off these problems by making sure that your cardiovascular system is in the best shape possible. Eating a diet that contains heart-healthy foods and is low in cholesterol and saturated fat can help. Exercising regularly also helps you maintain a healthy heart. VasculoSirt by Biotics Research is a supplement that provides you with a wide range of nutrients that support healthy cardiovascular function. Its unique formula includes vitamins&sbquo; minerals&sbquo; herbal extracts&sbquo; and other nutrients that work toward promoting heart health. VasculoSirt isn&rsquo;t meant to replace prescription medications or other types of treatment recommended by your doctor. Talk to your doctor before taking this supplement if you have a heart condition. Some of the active ingredients in each capsule include: Quercetin&sbquo; which might help prevent heart problems Niacin (vitamin B6)&sbquo; which might support cardiovascular health Magnesium to promote heart and bone health R-alpha lipoic acid&sbquo; which might protect your cells from free radical damage Green Tea extract&sbquo; which may boost energy while supporting the cardiovascular system One bottle of Biotics Research&rsquo;s VasculoSirt contains 300 capsules&sbquo; which should last for about one month. Take five capsules twice daily&sbquo; unless otherwise directed by your doctor. Biotics Research is committed to formulating and manufacturing innovative supplements. Its research and development arm is at the forefront of new developments in clinical nutrition&sbquo; discovering and analyzing the benefits of new ingredients. In addition&sbquo; all products supplied by Biotics Research have been shown to be effective and safe. These statements have not been evaluated by the Food and Drug Administration (FDA). These products are not meant to diagnoseÃ¢ÂÂ treat or cure any disease or medical condition. Please consult your doctor before starting any exercise or nutritional supplement program or before using these or any product during pregnancy or if you have a serious medical condition. 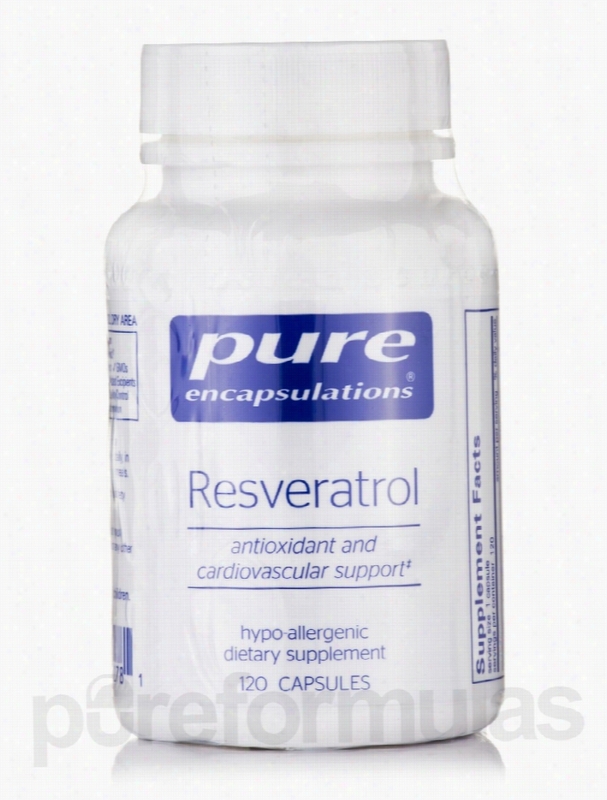 Pure Encapsulations Cardiovascular Support - Resveratrol - 120. Unfortunately, PureFormulas is not allowed to sell/ship this brand to international destinations. Cardiovascular problems can be stealthy&sbquo; and may have detrimental effects the disease can have on your standard of living. Maintaining a healthy heart increases your ability to lead a full and active lifestyle. One way to boost your cardiovascular health is maintain a healthy diet and a program of regular exercise. In addition to using preventative measures such as exercise and a good diet&sbquo; there are other ways to be good to your cardiovascular system. Resveratrol&sbquo; a substance found in red wine&sbquo; has long been linked to cardiovascular health benefits&sbquo; including the the prevention of blood clot formation and damage to blood vessels. Resveratrol has antioxidant properties that may also work to improve cardiovascular health through the maintenance of healthy platelets. Abnormal platelet function can result in a number of blood and cardiovascular problems related to clotting. Studies support the theory that resveratrol has a positive effect on cellular health by removing free radicals and promoting healthy enzyme functioning. However&sbquo; you may not be able or want to drink alcohol every day. An alternate solution is a supplement&sbquo; like Pure Encapsulations&rsquo; Resveratrol. These capsules provide you with the powerful antioxidant&sbquo; which is derived from one of the richest known sources of the compound on the planet: polygonum cuspidatum; this remarkable herb&sbquo; native to Japan and east Asia&sbquo; has been used as a medical and Nutritional aid for thousands of years. Each bottle of Resveratrol by Pure Encapsulations contains 120 vegetable capsules&sbquo; which is enough to last for up to four months&sbquo; depending on your dosage. Pure Encapsulations seeks to formulate and manufacture high-quality&sbquo; hypo-allergenic dietary supplements. Quality control during the formulation and manufacturing process is paramount. All Pure Encapsulations products are made with the most bioavailable ingredients possible. These statements have not been evaluated by the Food and Drug Administration (FDA). These products are not meant to diagnoseÃ¢ÂÂ treat or cure any disease or medical condition. Please consult your doctor before starting any exercise or nutritional supplement program or before using these or any product during pregnancy or if you have a serious medical condition. Arthur Andrew Medical Cardiovascular Support - Neprinol 500 mg - 300. Neprinol has been formulated by Arthur Andrew Medical to support healthy immune and circulatory systems in your body. Each capsule consists of multiple systemic enzymes used to promote blood purity&sbquo; which provides for healthier liver and Cardiovascular functioning. 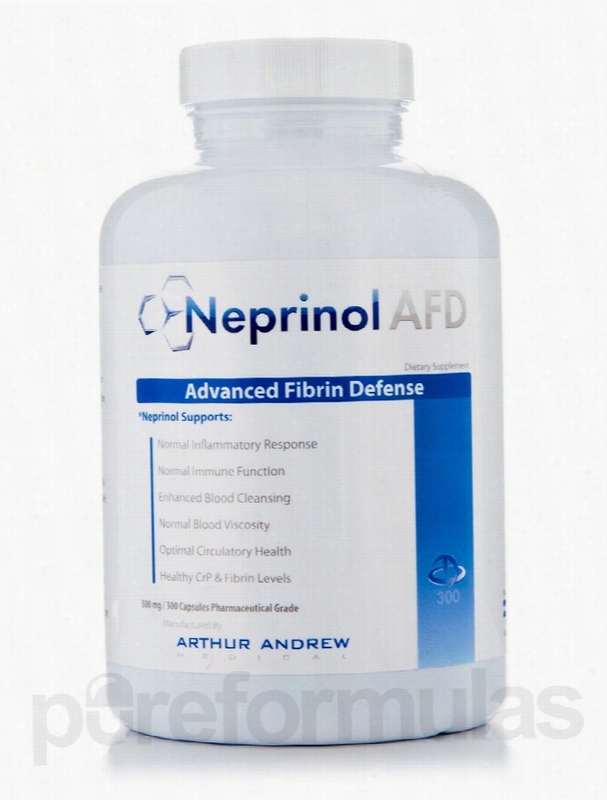 Neprinol is also used to promote healthy fibrin levels and reduce inflammation. Systeming enzymes in Neprinol include nattokinase&sbquo; serrapeptase&sbquo; papain&sbquo; and bromelain; each of these enzymes works to promote healthy levels of endogenous blood particles (EBPs) in your body. EBPs are unwanted particles fibrin or decayed cells in the blood stream. While some fibrin is necessary in the blood&sbquo; too much of it can result in severe blood clots&sbquo; deep vein thrombosis&sbquo; and stroke. Nattokinase has blood-thinning properties&sbquo; and is one of the main enzymes in this product; this can prove beneficial if you&rsquo;re susceptible to high levels of fibrin or arterial plaque. Nattokinase has even been used to prevent blood clots in the legs during extended airplane flights or other long periods of being seated! Serrapeptase&sbquo; another enzyme in Neprinol&sbquo; is used to dissolve blood clots and reduce inflammation. Bromelain is similar&sbquo; but it also breaks down protein in the digestive system and reduces the level of certain EBPs that contain protein. Rubin is a bioflavonoid that is able to reduce your discomfort from arthritis and varicose vein symptoms like inflammation&sbquo; pain&sbquo; and swelling. Neprinol also includes ubiquinone&sbquo; another natural substance that&rsquo;s vital to cell energy. It&rsquo;s often used as an antioxidant&sbquo; and ssome studies even show that it lessens the symptoms associated with heart failure for some people. Magnesium is another important ingredient in Neprinol&sbquo; due to its involvement in blood circulation and cardiovascular health. A healthy level of magnesium can reduce your risk of diabetes&sbquo; high blood pressure&sbquo; and cardiovascular disease. The suggested dosage of Neprinol can range from one to four capsules between meals&sbquo; depending on what your doctor recommends. This 300 capsule container is great if you&rsquo;re taking multiple capsules per day&sbquo; and allows you to save money while buying in bulk. These statements have not been evaluated by the Food and Drug Administration (FDA). These products are not meant to diagnoseÃ¢ÂÂ treat or cure any disease or medical condition. Please consult your doctor before starting any exercise or nutritional supplement program or before using these or any product during pregnancy or if you have a serious medical condition. Progressive Labs Cardiovascular Support - Cardio Flow - 180 Capsules. It's important that you take care of your cardiovascular system in order to stay active and healthy. Eating a well-balanced diet that's low in fat and sodium can help; but diet alone might not do it. 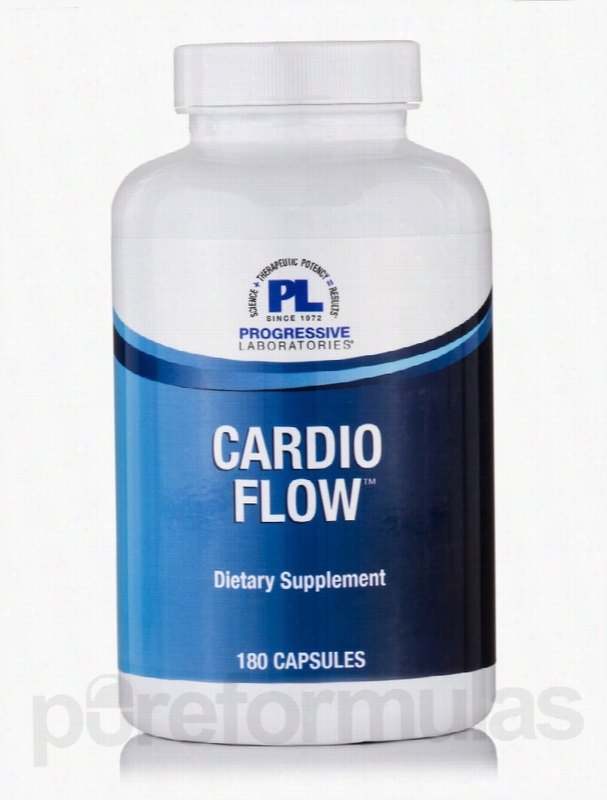 If you really want to promote healthy cardiovascular function&sbquo; regular exercise can do wonders&sbquo; as can the right cardiovascular supplement&sbquo; like Cardio Flow by Progressive Labs. Cardio Flow is formulated to address and possibly treat a wide range of factors that may affect your heart health. Each capsule of Cardio Flow contains important vitamins&sbquo; minerals&sbquo; and botanicals that are not only essential for cardiovascular wellness&sbquo; but also the possible promotion of liver function and memory. Its ingredients may also help your body remove harmful toxins. Some of the ingredients in Cardio Flow include: Vitamin A is an antioxidant that helps protect your cells from damage caused by harmful molecules known as free radicals&sbquo; atoms in our bodies that feature unpaired electrons&sbquo; which may pose health risks. Vitamin C is necessary for the growth and maintenance of healthy cells&sbquo; tissues&sbquo; and the healthy function of our Immune systems. Butcher's broom is a botanical that may help improve circulation. Papain is derived from papaya fruit and may reduce inflammation and fluid retention. Potassium is a mineral that helps control your heart's electrical activity Magnesium may support a healthy cardiovascular system This bottle of Progressive Labs&rsquo; Cardio Flow contains 180 capsules&sbquo; which should last you for about 30 days as long as you take the recommended dosage of two capsules&sbquo; which is three times a day. The dosage may be increased if your doctor directs you to do so. 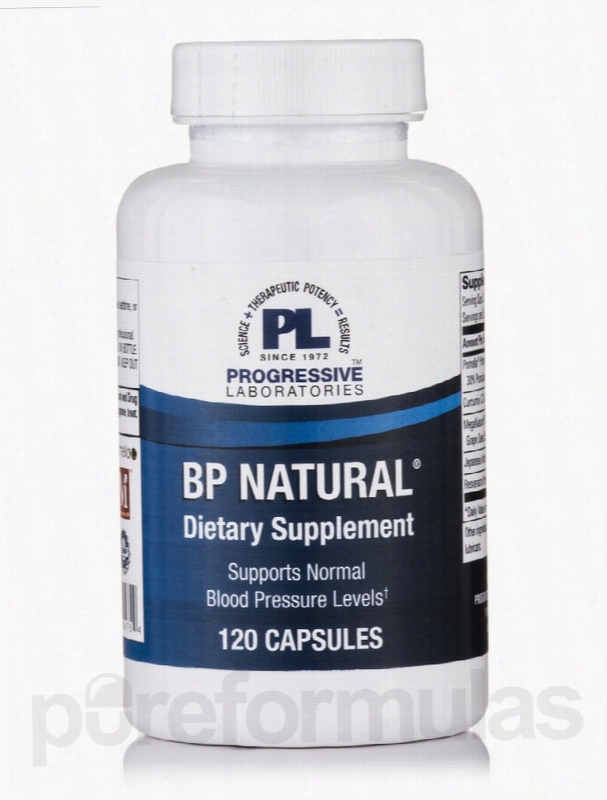 Progressive Labs has been a family owned manufacturer and distributor of nutritional supplements for 40 years. Progressive Labs has supplied over 25&sbquo;000 customers with professional grade vitamins&sbquo; herbals&sbquo; and dietary supplements. These statements have not been evaluated by the Food and Drug Administration (FDA). These products are not meant to diagnoseÃ¢ÂÂ treat or cure any disease or medical condition. Please consult your doctor before starting any exercise or nutritional supplement program or before using these or any product during pregnancy or if you have a serious medical condition. 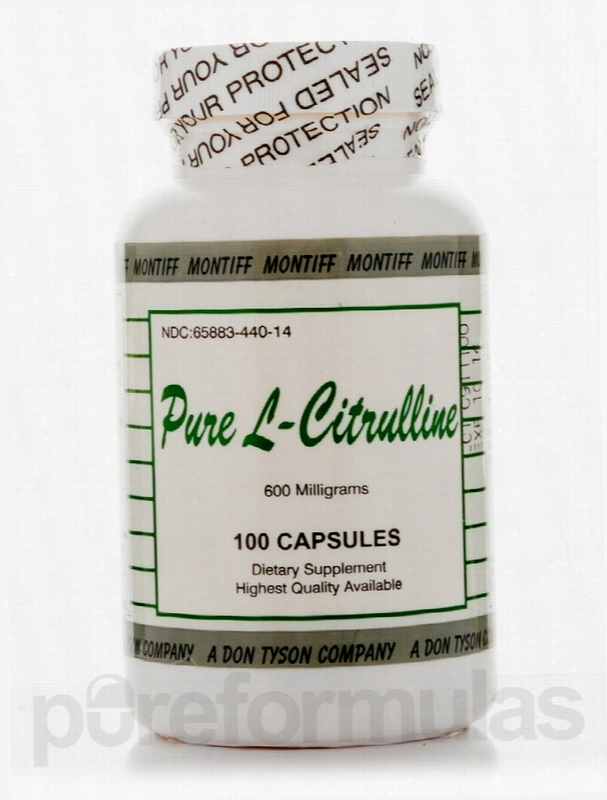 Montiff Cardiovascular Support - Pure L-Citrulline 600 mg - 100. Pure Encapsulations Cardiovascular Support - EPA/DHA-CoQ10 - 120. Unfortunately, PureFormulas is not allowed to sell/ship this brand to international destinations. If you have concerns about your cardiovascular health&sbquo; you should consider taking a broad-spectrum approach to the situation. You're trying to eat the right foods&sbquo; reduce stress&sbquo; and be physically active. Maintaining a healthy diet is another component of enjoying good cardiovascular health&sbquo; and one way to help ensure a balanced diet is through a supplement. After all&sbquo; your heart is one of the most important organs in your body! Your heart is kept healthy by an amazingly complex set of chemical reactions in your blood. EPA and DHA are essential fatty acids that contain omega-3 oils; these are commonly derived from cold-water fish. Inside your body&sbquo; these oils are converted to a substance called prostaglandin&sbquo; which helps produce and maintain healthy blood cells. Omega-3 fatty acids also serve to reduce inflammation&sbquo; which may be the source of many types of discomfort. Coenzyme Q10 is a vitamin-like compound naturally present in your body. It's a necessary part of your cells' communication and transport system&sbquo; and your body relies on it to generate physical energy. You do get some of this important nutrient from your diet&sbquo; but it&rsquo;s difficult to have sufficient intake if you don't eat a lot of meat and fish. Since these compounds foster health at the cellular level&sbquo; a supplement like Pure Encapsulations&rsquo; EPA/DHA-CoQ10 can help more than just your cardiovascular system. The CoQ10 in each vegetable capsule may relieve headaches and promote heart health. Meanwhile&sbquo; DHA and EPA provide support to the brain by promoting memory&sbquo; focus&sbquo; and concentration. 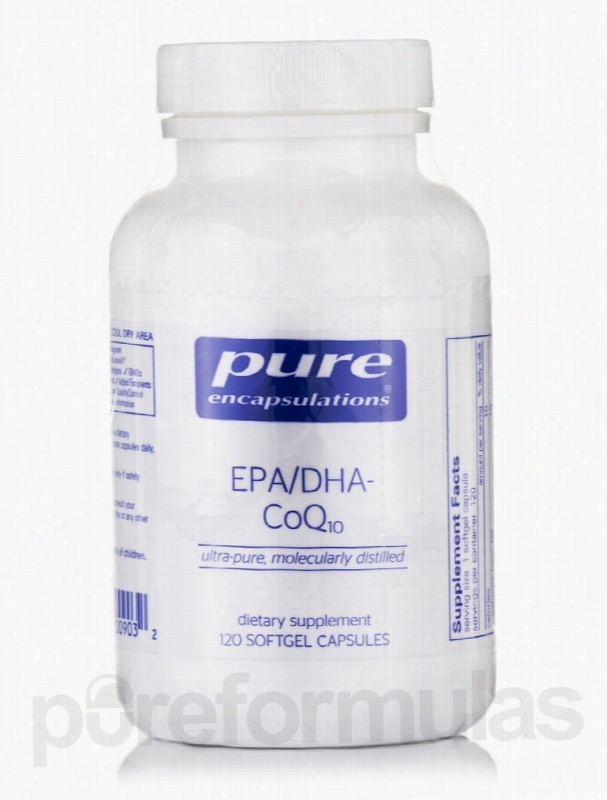 This bottle of EPA/DHA-CoQ10 by Pure Encapsulations contains 120 softgel capsules&sbquo; which should last for up to four months&sbquo; depending on your dosage. Pure Encapsulations seeks to formulate and manufacture high-quality&sbquo; hypo-allergenic dietary supplements. Quality control during the formulation and manufacturing process is paramount. All Pure Encapsulations products are made with the most bioavailable ingredients possible. These statements have not been evaluated by the Food and Drug Administration (FDA). These products are not meant to diagnoseÃ¢ÂÂ treat or cure any disease or medical condition. Please consult your doctor before starting any exercise or Nutritional supplement program or before using these or any product during pregnancy or if you have a serious medical condition. Pure Encapsulations Cardiovascular Support - CoQ10 - 60 mg - 250. Unfortunately, PureFormulas is not allowed to sell/ship this brand to international destinations. Coenzyme Q10 (also known as CoQ10 or ubiquinol) is essential to your overall health for several reasons. Most importantly&sbquo; it helps your cells produce energy. This energy is needed by tissues throughout the body; certain tissues-such as the periodontal (gum) tissue&sbquo; immune cells&sbquo; and heart muscle-tend to need far more energy than others. How does CoQ10 provide this energy required for physiological functions? It gets involved in the mitochondrial electron transport chain by driving electrons down to a specific molecule. This molecule is called ATP (adenosine triphosphate)&sbquo; and it is responsible for producing the energy that supports all of your cells. By striving to stimulate ATP production&sbquo; you may experience more energy. Common dietary sources of CoQ10 range from organ meats to whole grains and oily fish. In some cases&sbquo; you may require additional coenzyme Q10; that's where supplementation can help. 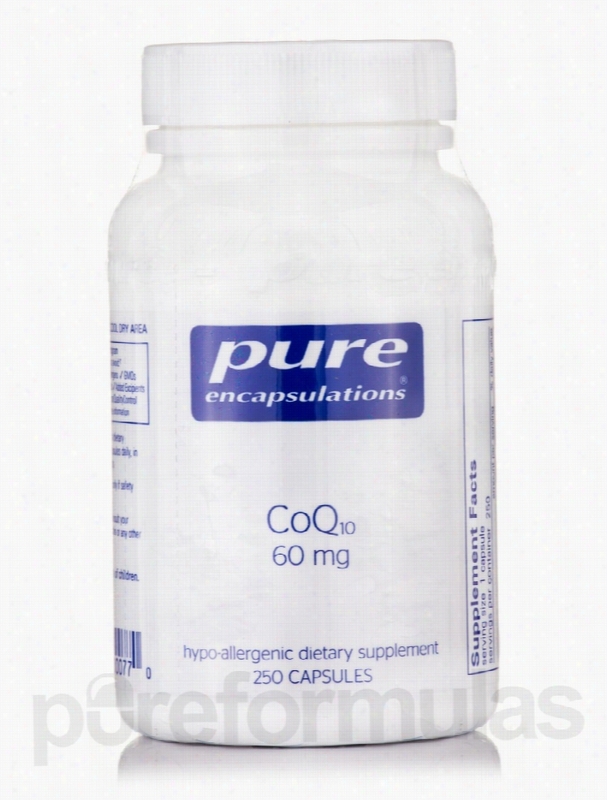 Pure Encapsulations' CoQ10 60 mg provides a mild boost to energy production&sbquo; cellular functioning&sbquo; and tissue health. One capsule contains 60 milligrams of coenzyme Q10&sbquo; which can also serve as an antioxidant that works to protect cells from potentially damaging free radicals. This happens while it is also supporting lipid metabolism and protecting vitamin E integrity. The possible benefits of CoQ10 60 mg extend to the Cardiovascular system. Since it plays a role in supporting cardiovascular tissues&sbquo; it may promote healthy heart muscle function&sbquo; as well as good blood flow. The CoQ10 in this supplement is derived through natural microorganism fermentation. Take one or two capsules daily&sbquo; in divided doses with meals. At the recommended dosage&sbquo; each 250-capsule bottle of CoQ10 60 mg by Pure Encapsulations should last from about four to eight months. Pure Encapsulations seeks to formulate and manufacture high-quality&sbquo; hypoallergenic dietary supplements. Quality control during the formulation and manufacturing process is paramount. All Pure Encapsulations products are made with the most bioavailable ingredients possible. These statements have not been evaluated by the Food and Drug Administration (FDA). These products are not meant to diagnoseÃ¢ÂÂ treat or cure any disease or medical condition. Please consult your doctor before starting any exercise or nutritional supplement program or before using these or any product during pregnancy or if you have a serious medical condition. 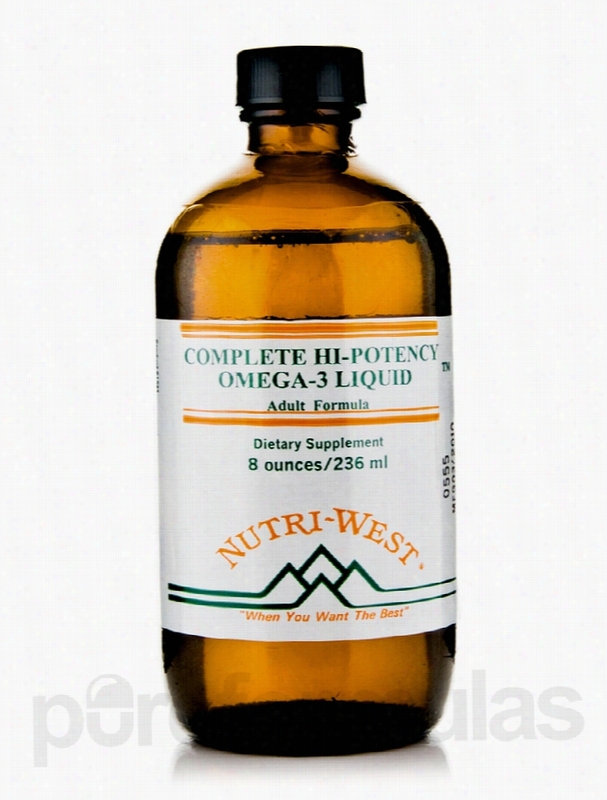 Nutri West Cardiovascular Support - Complete Hi-Potency Omega-3 Liquid. Omega-3 fatty acids have been gaining a lot of attention recently&sbquo; and rightfully so. They may help maintain a whole host of healthy bodily functions. That's why Nutri West's Complete Hi-Potency Omega-3 Liquid has been formulated with EPA&sbquo; DHA&sbquo; and more to potentially support your body with these essential fatty acids. EPA Also known as Eicosapentaenoic acid&sbquo; this essential fatty acid is derived from various marine animals and seaweeds. In terms of health benefits&sbquo; it's possible that EPA may feature anti-inflammatory properties. It has also been suggested that this essential omega-3 fatty acid possesses the ability to potentially deter blood clots&sbquo; which can have certain implications for cardiovascular health. DHA Often used in conjunction with EPA&sbquo; DHA (docosahexaenoic acid) is also found in cold-water marine animals. As a supplement&sbquo; some individuals utilize DHA to potentially aid in the development of the eyes. Additionally&sbquo; and similarly to EPA&sbquo; DHA may pose potential benefits for cardiovascular issues like blood thickness&sbquo; level of triglycerides&sbquo; and possibly more. Flaxseed Oil Complete Hi-Potency Omega-3 Liquid is also formulated with flaxseed oil because it is a source of alpha-linolenic acid&sbquo; or ALA. This omega-3 fatty acid is believed by some to possibly help promote cardiovascular health. It is also possible for our bodies to synthesize EPA from dietary ALA like the kind found in flaxseed oil. For added benefit&sbquo; Complete Hi-Potency Omega-3 Liquid is also formulated with Vitamin E (which may have antioxidant properties) and black currant seed oil. Nutri West provides nutritional supplements to health care professionals in order to optimize their patients&rsquo; well-being. It was founded in 1981 and has expanded into a worldwide company with state-of-the-art&sbquo; environmentally-friendly manufacturing and packaging processes. Its products are hypo-allergenic and have been formulated for the highest quality. These statements have not been evaluated by the Food and Drug Administration (FDA). These products are not meant to diagnoseÃ¢ÂÂ treat or cure any disease or medical condition. Please consult your doctor before starting any exercise or nutritional supplement program or before using these or any product during pregnancy or if you have a serious medical condition.